i saw that! that's hilarious! post yours! My favorite dwarf is Thorin Oakenshield, of course. But I love every single dwarf of Thorin & Co.
lol it does fit here if we're about to talk of all of them together. yeah I think you know who is my favourite dwarf,really...I think I make it quite obvious. Aww Maone, this rocks!!! It 's awesome!! You could probably guess who my fave dwarves are. But I don't love them to the extent that I worship them! 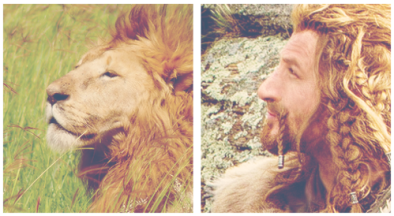 I love Fili and Kili the same! Fili has this cuute cheeky charm about him and Kili is very cute though looks stern in a lot of his pictures, is very sweet! They're typical boys. Not really a fan...;) At a push it would have to be Kili, Fili looks to full of himself lol. Raevienne Amber wrote: Not really a fan...;) At a push it would have to be Kili, Fili looks to full of himself lol. Oh I love your signature raevie! Such a cute elf girl! She looks almost faerie like! So cuute! 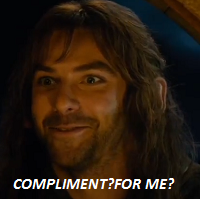 I love Thorin as much as Fili, Kili a bit less. I like Bofur too, he's a nice dwarf who cares abou the hobbit (goes to help him when he'ss hanging on the cliff) and has a really cute smile. Balin and Dwalin are just great pals I'd love to hang out with. 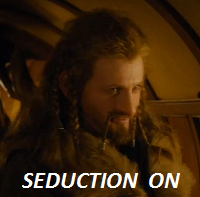 And Thorin, well, he makes such an impression that I would follow him to the gates of Hell.